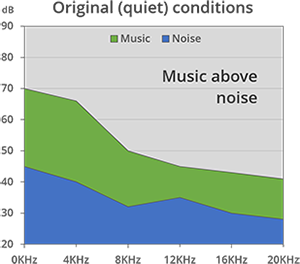 Comfortable listening of music in conditions with varying ambient noises requires constant changes in sound volume (with changes in noise level) and equalization (with changes in noise spectrum). This situation happens, for example, while listening to music from a mobile phone on-the-go and for music reproduction inside a vehicle. Today the listener is forced to adjust the volume and equalizer manually, which is at minimum inconvenient but possibly dangerous. Automatic Volume and Equalization control for Music and Entertainment (AVQ-Me™) technology, being an extension of AVQ technology, amplifies and equalizes music content according to ambient noise characteristics providing equal perceptual loudness, intelligibility and sound coloration in conditions where noise level and spectrum change dynamically. The technology is suitable for high quality music, audio devices of the "Hi-Fi" class and all applications where sound and music are important such as modern mobile phones, digital audio players and portable gaming consoles. 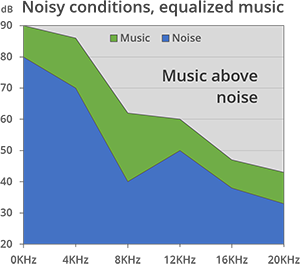 The technology greatly improves the listening experience in mobile conditions. AVQ-Me™ can be easily implemented into devices already integrating a microphone for voice communication purposes. The microphone is then used during the music play to monitor the current noise conditions. The microphone signal is analyzed and the ambient noise parameters are extracted. 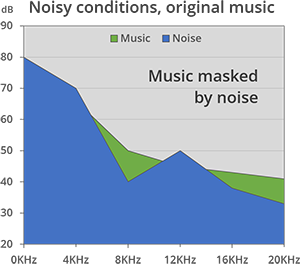 A very reliable Voice Activity Detector (a part of Alango Noise Reduction technology) is used to avoid the user's own speech having an impact on the sound volume and equalization parameters. The noise characteristics are fed into the music equalization block. This block dynamically amplifies parts of the signal spectrum masked by noise ensuring equal intelligibility and perceptual loudness in variable noise environments. Bluetooth stereo headsets, mobile phones, portable media players, car entertainment systems and other audio playback systems where the ambient noise level can vary. Although it can be used standalone, AVQ-Me™ is also integrated with other Alango audio enhancement technologies into one MuRefiner™ (Music Refiner) package. The package also includes ListenThrough™, stereo and bass enhancements, spectral compander, multi-channel dynamic range compressor and loudspeaker correction blocks.